You guys know how I have struggled with promoting ASCP, when it is so stinking expensive, so this was intriguing! One of my awesome readers, Carla, has been experimenting with different formulas of home-made chalk paint and I sent the link to her last night. I knew this would be right up her alley too…. Wanna’ see this awesome blogher’s post? Bet you wish I would hurry and give you her link, don’t you? GENIUS! Can’t wait to try it! Let me know if you do and what you think. I’m worried about chipping and flaking after it sits for a bit. Let me know what you find out, if you try it first! NOW…..onto the milk paint giveaway! Send me your address! Email me at youaretalkingtoomuch@yahoo.com and I will send it out! You won’t believe what I got off of Craigslist. Can you tell from this peek what this is? congrats to Anita…and I LOVE the vanity ..I will go now and check out her Â blog about the four dollar chalk paint wow that is so cool…I wonder if it is up to quality standards ofÂ everyoneÂ too…we shall have to see ! This is fantastic news!!!!!! Â I’m so glad there are smart people in the world so that people like me can know stuff!!!! Â 🙂 Â Thank you for sharing this!!!!!! 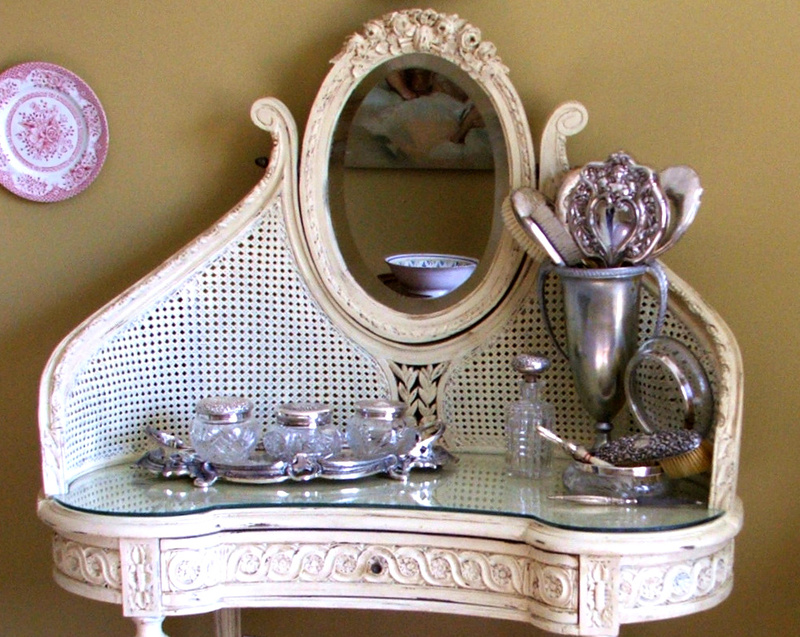 Love the Vanity! Beautiful, wish it was mine…….I’ll check out her blog and be sure to tell her you sent me. Anybody that can invent $4.00 chalk paint has my attention!! Thanks for the info!! Hi! Â Can’t tell what that is other than its gorgeous! Love the vanity. Congrats to Anita on winning the milk paint, how cool! I’m trying to find out how much per piece the ASCP is, its so expensive but you do get a lot of pieces from a quart. Have you decided?? I bought 3 quarts and have used about 1/3 of each quart…so I think I’ve used 1 whole quart altogether. I’ve painted 6-8 end tables, a sofa table, 3-4 large sconces, lots of picture frames, paper towel holder, a small shelf and a few other odds and ends. You do get a lot out of a can…so is it cost effective? Maybe?? I can’t decide! Â If I read the post about the $4. milk paint correctly she made enough for just the vanity. If so how much would it cost to paint the above mentioned pieces? Gets confusing, huh? Have you figured out how many pieces you get out of a quart of ASCP? Hopefully…please:)…since you now have milk paintyou’ll being doing some comparisons. Enquerring (how on earth do you spell that? 🙂 minds want to know!! I already love you, Rebecca!Â Â Thank you so much for the post and the link.Â No chippingÂ Â or flaking on the pieces I painted using these formulas.Â I can’t even scrape the paint off now with my fingernails.Â Congrats to Anita and thanks again. I could hardly wait to get home and try out the recipe; luckily I already had plaster of paris on hand.Â My test piece is drying as we speak, and I can already tell that I am going to be downright dangerous armed with this knowledge! It looks like itÂ will need another coat, so hopefully I can post pictures tomorrow night.Â Just for kicks I also tested some on a crappity laminate shelf I’m re-doing for my daughter and it looks like it’s gonna stick!